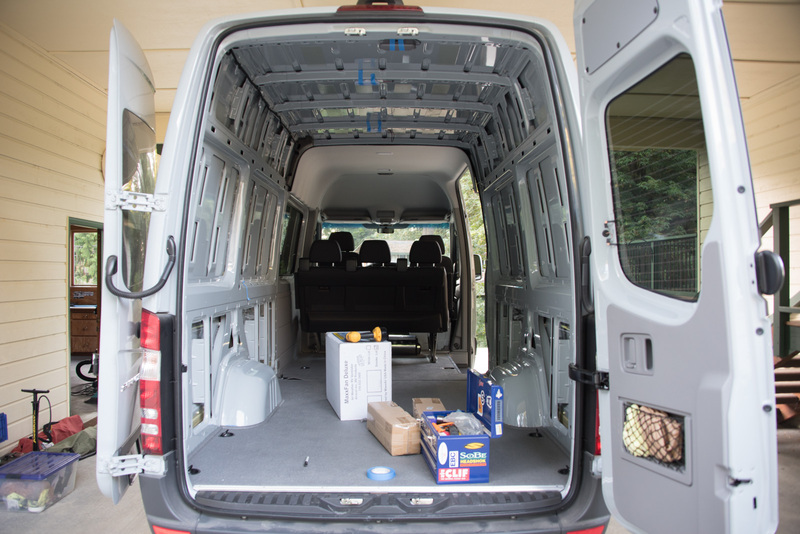 It’s really easy to take the inside out of a Sprinter van. I’m not sure if that’s a compliment. There are lots of plastic pieces that just unclip. We bought a Crew van, so it comes with a headliner, rear door inserts, and plastic panels on the walls up to the mid-line. The areas that would be windows in the back are just bare metal. The passenger van comes with more paneling, covered in vinyl. The passenger van also has more windows, which we didn’t want. Because we need to insulate and we intend to use fabric-covered plywood on the walls and ceiling of the van we had to start by taking out the current interior. It’s mainly held on by plastic clips, which either pop out really nicely or break really nastily. The bench seat is easy to remove (two catches on the legs) but it’s heavy. It helps to have two people to lift it out of the van. We found that it fits really nicely on to a cart so we can drag it around for storage. Once the inside is out, you get a real understanding of how crazy the interior construction is. There are hardly any right angles or straight lines, and the ribs and interior metalwork don’t seem to repeat at regular intervals. There are no clear runs from front to rear for wires, and even the window surrounds aren’t horizontal or level. 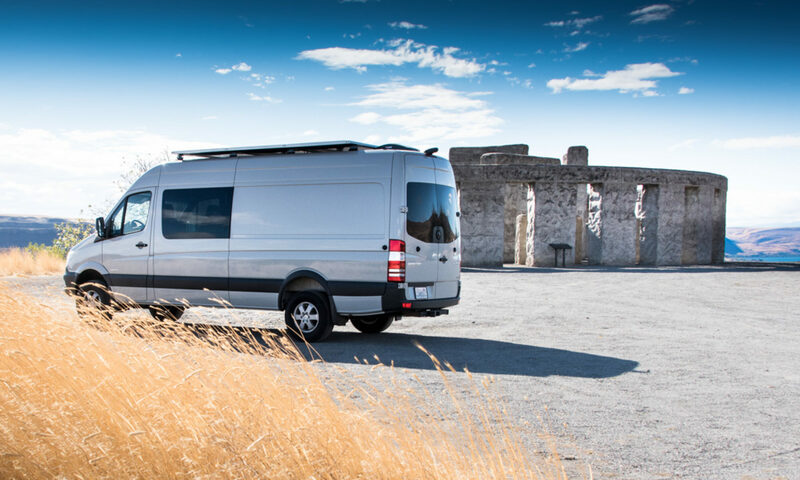 1) The Westfalia people in Germany use a fresh water tank that wraps around the wheel, space more efficiently. 2) Westfalia also has a real cool galley unit in their Columbus D600. I have pictures for both you may like to see. 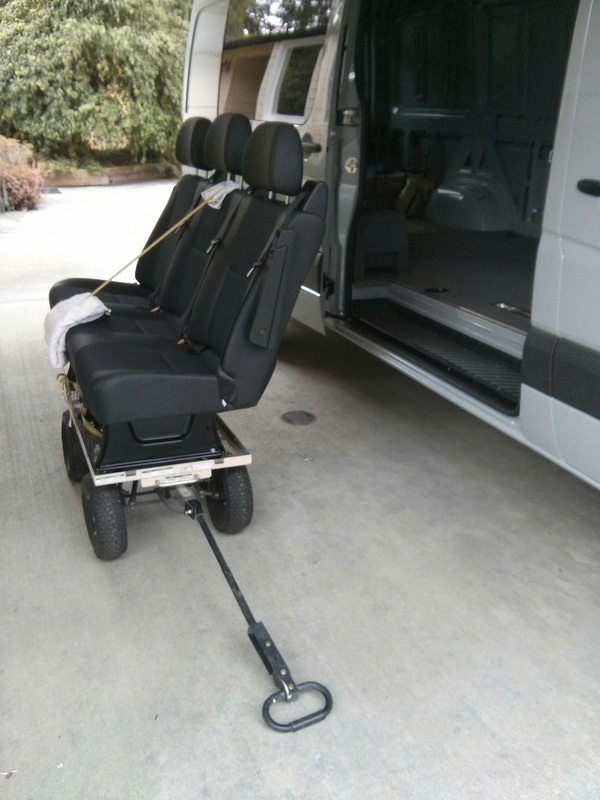 Gear: 2008 Sprinter 144″ Sportmobile 2010 convert. Maybe replaced with a new 4×4 Sprinter after relocating up North. Udo, that Reimo resource is a good link. It’s just a shame we can’t get some of the components that are available in Europe such as the floor and floor rails. Previous PostPrevious We bought a van!